Bojtos depicts the classic Greek Myth in artistic, high bas-relief. He uses only hammer in chisel for his stock removal, and heâ€™s revered as being the only art knife maker in the world to use nothing but a chisel, hammer, files, and sandpaper. Quite singular are his knives. I have not had one to list for 2 years, as they are all in the safes of top collectors. Bojtos has won the top award at the last two Blade Shows (largest in the world) for Best Art Knife and the Cronk Award at The Knifemakers Guild Show. The mythical story of Medusa with her hair of snakes is a great read and is easily seen on Google. 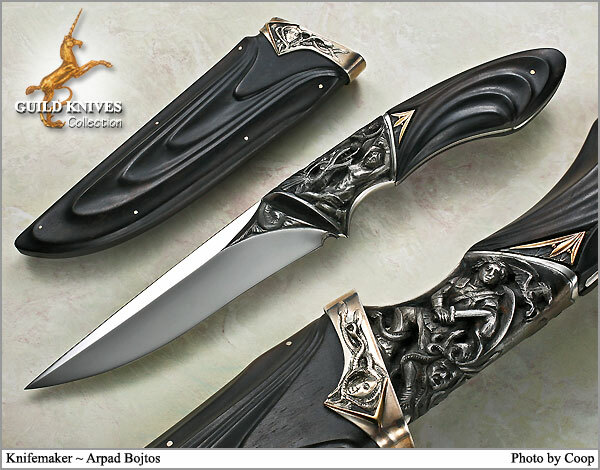 Arpad makes about 9 knives a year, and they are running at about $9,000 each plus a yearâ€™s wait.